In our paper published in Nature Communications, we report a general strategy to anchor enzymes to tissues at injection sites via fusion to galectin-3, a carbohydrate-binding protein. Many achievements in modern medicine can be attributed to enzymes, the proteins that catalyze biochemical reactions. Therapeutic enzymes offer effective treatment for various diseases, such as acute lymphoblastic leukemia, SCID, and Gaucher disease. Often, success of enzymes as drugs hinges on engineering approaches that improve their pharmacokinetics, pharmacodynamics, and safety - PEGylation, antibody fusion, and glycosylation have revolutionized delivery of therapeutic enzymes. Yet, a growing number of promising enzyme candidates are abandoned because they fail to accumulate at the right tissue site for a useful duration of time, which abolishes their therapeutic effectiveness. This ongoing dilemma motivated a team of biomedical engineers at the University of Florida, led by Drs Hudalla and Keselowsky, to develop a strategy that anchors enzymes to tissues at an injection site for days to weeks, reported in Nature Communications (DOI:10.1038/s41467-018-07129-6). Taking notice of Dr. Hudalla’s expertise in biomolecular engineering, a few years ago Dr. Keselowsky invited him to discuss opportunities to improve enzymes gaining traction as immunotherapeutics. They noted that key issues stifling the use of enzymes as drugs include deleterious side-effects resulting from poor control over biodistribution, as well as the loss of enzyme activity after encapsulation within particle-based delivery systems . What began as a short conversation on an enduring need for new enzyme delivery modalities soon blossomed into a lasting collaboration between their research groups. Their general concept is that engineering enzymes to bind to extracellular carbohydrates will restrict their diffusion through tissues, thereby providing prolonged local enzyme activity (Fig. 1a-c). Similar interactions are widely used for delivery of growth-stimulating proteins that have inherent carbohydrate-binding properties ; however, enzymes typically lack binding affinity for carbohydrates. Having recently co-authored a review focused on engineering galectin-glycan interactions with student Shaheen Farhadi , Hudalla suggested that the human carbohydrate-binding protein galectin-3 could be fused to enzymes to endow them with carbohydrate-binding properties (Figure 1a). Galectin-3 is an ideal fusion partner for enzymes – it lacks disulfide bridges and does not require post-translational modification, features that greatly simplify its recombinant production. Moreover, the structure and carbohydrate-binding properties of galectin-3 are conserved among mammalian species, suggesting both a low risk for inducing a harmful immune response, as well as potential for use in both human and veterinary applications. A unique feature of galectin-3 is that it naturally assembles into structures having multiple carbohydrate-binding sites, which increases its carbohydrate-binding affinity. Inspired by these observations, the team also developed a variant of their fusion protein that can assemble into a structure having three galectin-3 domains, referred to as a trimeric nanoassembly (Fig. 1e). The fusion protein and trimeric nanoassembly have different binding affinity for extracellular carbohydrates (Fig. 1d-e), which provides a simple route to tune the duration of time over which enzymes are anchored to tissue injection sites. Moving forward, the team envisions that galectin-3 fusions will be useful for extending local pharmacokinetics of emerging therapeutic enzymes as well as those that have stalled in the development pipeline. Figure 1. Design of galectin-3 fusion proteins to locally anchor enzymes to tissues via extracellular glycan binding. a-cSchematic of recombinant enzymes fused with galectin-3 (i.e., enzyme-G3 fusion protein), which are anchored to an injection site via binding to cell surface and extracellular matrix (ECM) glycans. dMonomeric fusion protein consisting of an enzyme linked to the N-terminal domain of galectin-3 via a flexible peptide linker.eTrimeric nanoassembly formed by inserting the TT domain between the enzyme and G3 domains. 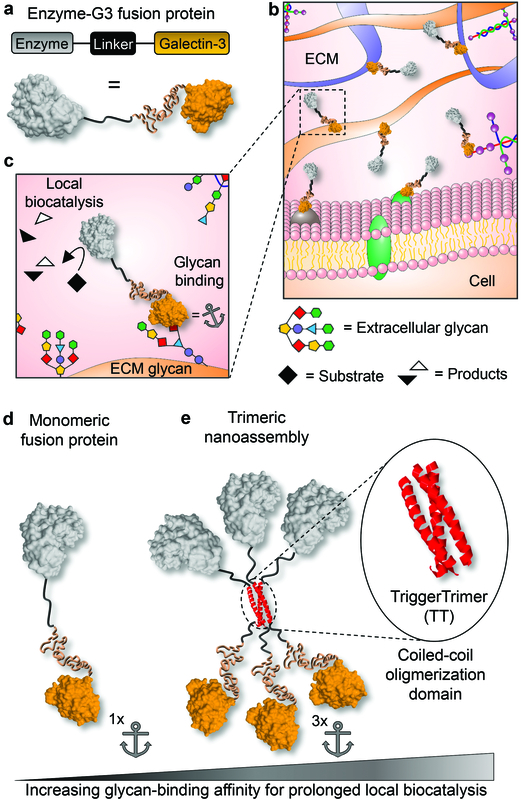 The trimeric nanoassembly has higher glycan-binding affinity than the monomeric fusion protein due to multivalent avidity effects. Farhadi, S. A., Bracho-Sanchez, E. R., Freeman, S. L., Keselowsky, B. & Hudalla, G. A. Enzymes as immunotherapeutics. Bioconjugate Chem.29, 649-656 (2018). Hudalla, G.A. & Murphy, W.L. Biomaterials that regulate growth factor activity via Bio-inspired interactions. Adv. Funct. Mater.21, 1754-1768 (2011). Farhadi, S.A. & Hudalla, G.A. Engineering galectin-glycan interactions for immunotherapy and immunomodulation. Exp. Biol. Med. (Maywood) 241,1074-1083 (2016). Our paper: Farhadi, S.A. et al.Locally anchoring enzymes to tissues via extracellular glycan recognition. Nat. Comm. 9,1-14 (2018) [doi: 10.1038/s41467-018-07129-6].